Discussion in 'Price Drops, Must-Have Freebies, and Deals' started by Habakuk, Dec 21, 2014. A pig with a lion mane! 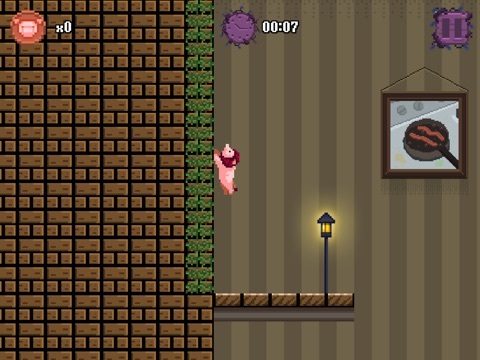 Lion Pig is now completely free to play. No Ads or In App Purchases. Enjoy the game! 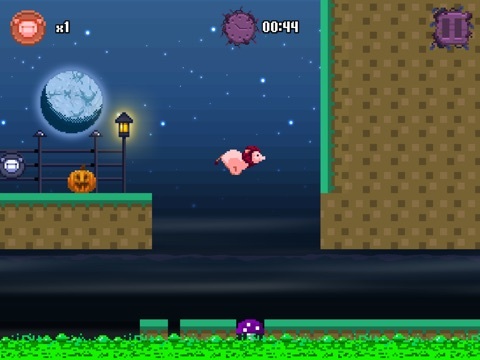 "Leaving aside the biology of how a pig and a lion might meet, fall in love, and create this curious cross-breed, Lion Pig is a really well made platformer." 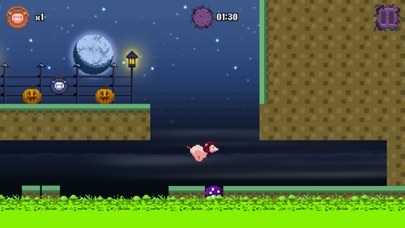 - AppSpy "Lion Pig fuses the king of the jungle and the world's source of breakfast bacon into a single beast for the ultimately old-school platforming adventure." - IGN "The Gameplay offers plenty of different mechanics as well as unique challenges, and overall it’s a really solid Platformer." 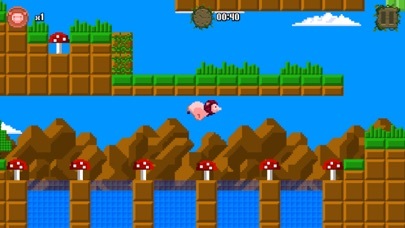 - PocketMeta.com Lion Pig is an arcade-style platform / speed run game featuring pixel graphics. From the bright and sunny grasslands to the moss-covered skyscrapers of Techno City, you will run, climb, swim and bounce your way through 7 different worlds, each with unique challenges. Climb walls, scale ceilings and use your lion strength to maneuver through each level to collect all of the golden coins. If you complete levels fast enough you will unlock bonus levels which offer a very unique experience! Features: • 48 Levels in 8 different worlds: Grasslands, The Water Hole, Windy Sands, Frozen Valley, Lava Castle, Techno City, Hallow Land, and Emerald Highlands • 8 Bonus Levels in the Mysterious Black and White World, each with a unique theme and challenge • Find all 6 hidden emerald coins to unlock the Emerald Highlands. 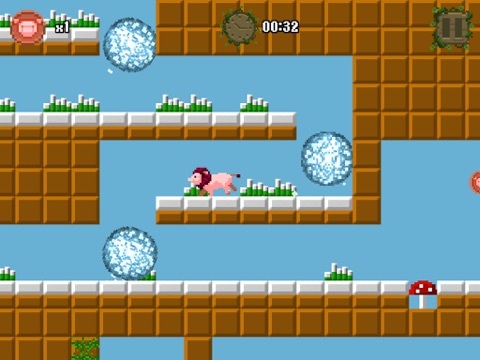 The Emerald Highlands features a speed powerup bringing a new unique element to Lion Pig. 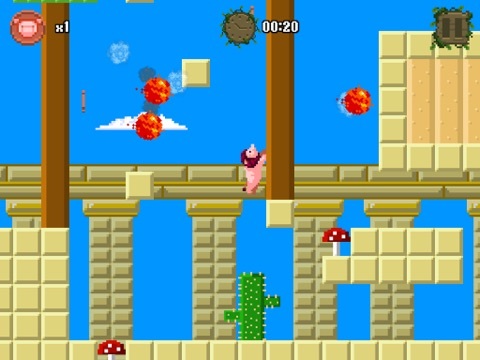 • Various obstacles including fireballs, snowballs, spinning blades, spike walls, jellyfish and more • Game Center Leaderboards and Achievements • iCloud Support • Simple and intuitive touch controls make Lion Pig a fun game for players of all ages • Fun music soundtrack inspired by retro and modern styles Lion Pig Awaits. Download today! There is another video in the store. Some puzzle elements and NO jump button (use mushrooms). Diving: Just wait until the animal sinks down. Published two months ago, free for the first time. Recommended! The game is not a runner. It's a non-traditional platformer. Here's what I mean. There are no virtual controls. 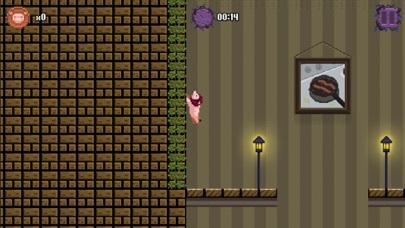 Players control Lion Pig by pressing on the right side of the screen to move right. Pressing on the left side of the screen to move left. Swipe in specific directions to wall jump as well as drop from ceilings. 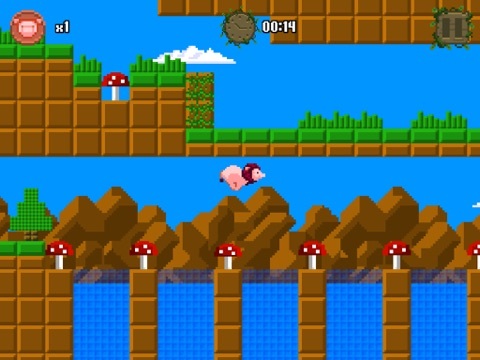 The game has a heavy focus on both horizontal and vertical movement and you use your surroundings to complete levels. It's not a traditional platformer where you have left right arrows and a jump button. It's not designed that way so if you are expecting this then I don't want you to be shocked! It is however, very easy to control as even my buddy's 3-year old can play the game. But hey, don't take my word for it: I'm only the developer who is probably trying to make a buck or two. haha. But no in all seriousness Lion Pig is a fun game with no gimmicks or strings attached. Just a fun platformer with a good amount of content and tons of replay value. One of my favorite games of the year. A great platformer/speed runner that you should download and play immediately! nice, thank you. been meaning to try this out... I dl'd the free/ lite version a while back, but never got around to it. I'm not playing too many ios games anymore, but I'll give this one a try.